in October and a brunch meeting in December. Locations and pricing vary as venues change. following the luncheon in the same month. 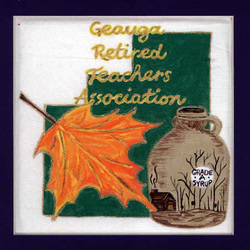 The Geauga County Chapter of retired teachers was officially organized on October 19, 1966 at Punderson Manor House in Newbury. Twenty-seven retired teachers met for lunch, adopted the constitution, by-laws, and elected officers. GCRTA's membership increased to 90 members by 1968 and is presently at 300. Notable guest speakers were brought to luncheon meetings and welfare activities were encouraged. In December of 1982, members started bringing food stuffs and money to the luncheons to be distributed to the Geauga County welfare recipients. In August 1988, the first collegiate scholarship award was presented. It is now given annually to a Geauga County high school seniors studying education under our Grant-in-Aid program. A total of 40,000 volunteer hours were given by members in 1995 and his tradition continues every year. Currently the GCRTA has 382 members with 81 ORTA life members and 59 yearly ORTA members. It is our goal to increase the number of our members in the ORTA ranks. All general meetings are held every other month, starting in February, on the second Tuesday of the month. Various venues are chosen to provide our members a luncheon or brunch after the business meeting. All Executive Committee meetings are held every other month, starting in January, on the first Tuesday of every month. ​See our web site for meeting dates and locations.